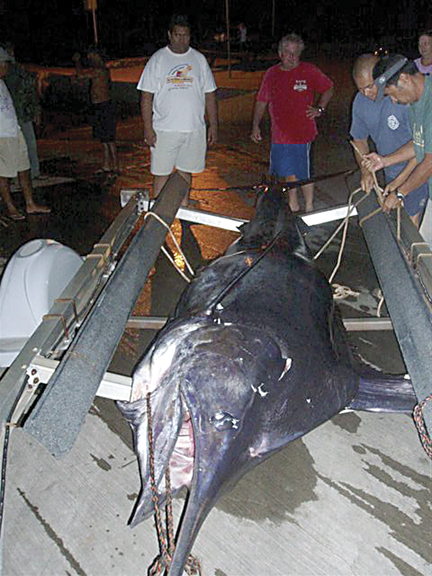 Daniel Fuchigami caught his 1,140-lb Pacific blue marlin on June 1, 2009. He was fishing alone on his 18-foot Nautico MANELE KAI powered by a 75-hp Evinrude Etec motor. He was off of Kamalapau Harbor at 1 p.m. and had just put his lines out with a brand-new lure that he got the previous Saturday from Steven Lichter on Lana'i. Daniel hooked up on a Penn 80W reel with 150-lb test mono. After four hours of fighting this fish, he was only a few hundred yards on the inside of NASA buoy. The fish had dragged him about 7 miles.